Welcome back Ninth Agers and this the write up of fifth and my final game of the Breakthrough tournament. My List can be found in my game 1 blog post here. So my opponents list doesn’t contain the worst offenders in the Orcs and Goblin army but there is still plenty of things in that army for me to fear. The War Machines always have the potential to ruin my poor knights and they definitely mean I can’t run my Duke solo so he’ll be hiding in with the Pegasus Knights. The Gargantula is not a monster to be taken lightly and hopefully I can get my Questing Knights or my Duke into it and kill it quickly or else it will destroy my knights. The Warlord on the Wyvern presents the same problem too as he packs a punch but is even more mobile. There’s two medium sized blocks of Orcs, the Ferals and the Iron Orcs. Hopefully I can whittle them down a bit with magic and shooting and then smash through them. If I can get a successful double charge off on them then I should win that fight but there is plenty of chaff in my opponents army to stop that from happening. There’s 2 Hero characters who may not be the toughest of fighters they can certainly cause me problems, 3 units of scoring cavalry could be problematic depending on the scenario or they could just chaff me up. 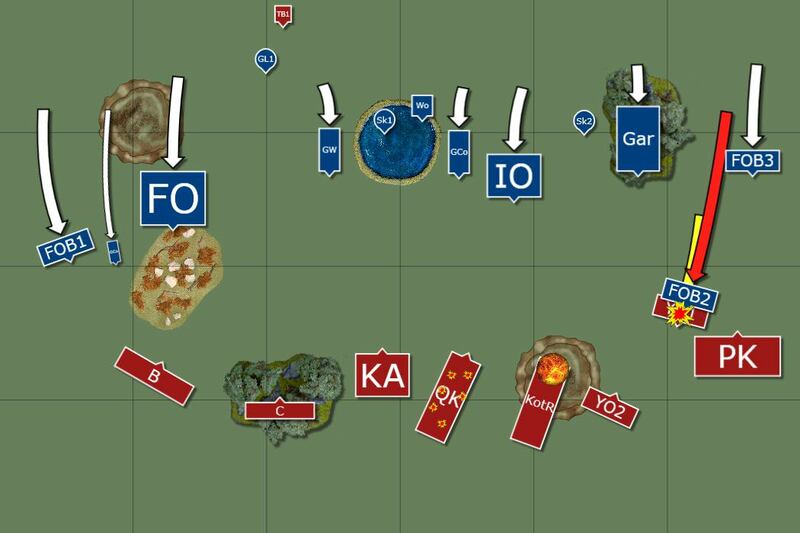 The Deployment type for this scenario turned out to be Frontline Clash and the Secondary Objective is Hold the Ground, not a great one for the Kingdom I think, we’re not great at sitting on objectives, the horses need to be moving! For my spell selection I pick Breath of the Lady, Swarm of Insects (might get lucky and get a wound or two on a monster or kill a Warmachine), Totemic Summon and Break the Spirit. My opponent picks Awaken the Beast, Swarm of Insects, Totemic Summon and Break the Spirit, the best 4 Shamanism spells out of the 6 by a mile, Chilling Howl has it’s uses but it’s to circumstantial and does anyone ever take Savage Fury? The Orc Chieftan gets Cosmology on his Wizard Crown and takes the Signature spell for Orcs & Goblins, Bring the Pain and takes the first Cosmology Spell, Altered Sight. 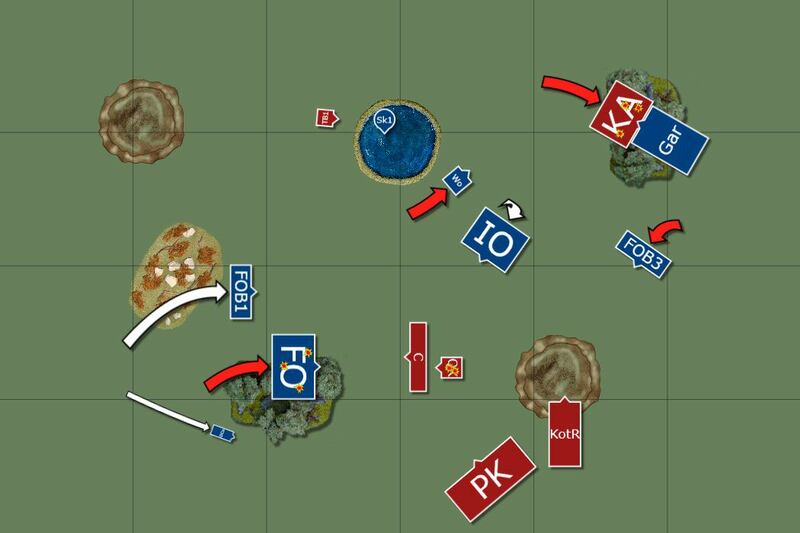 We take turns deploying the whole way for deployment with no one dropping the whole army in one go. 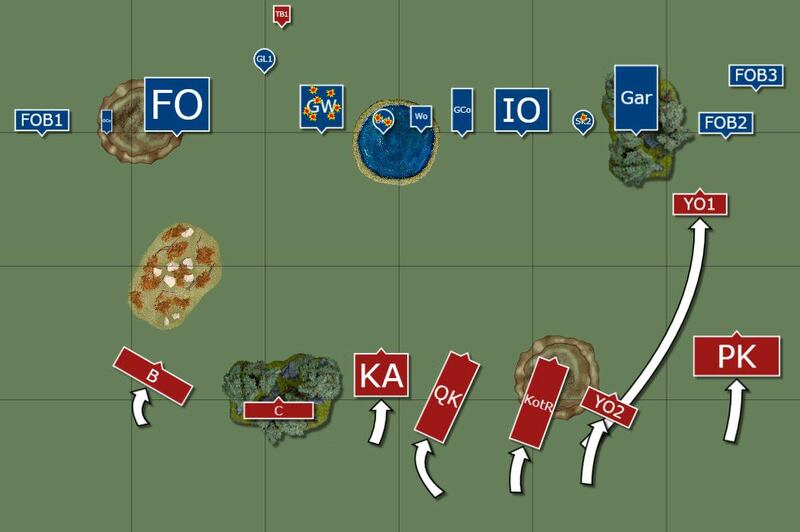 I decide to focus my army on the right flank rather than trying to fight everywhere. If I can kill The Gargantula on the right I should be able to take the right but first things first, I need to kill those pesky warmachines. 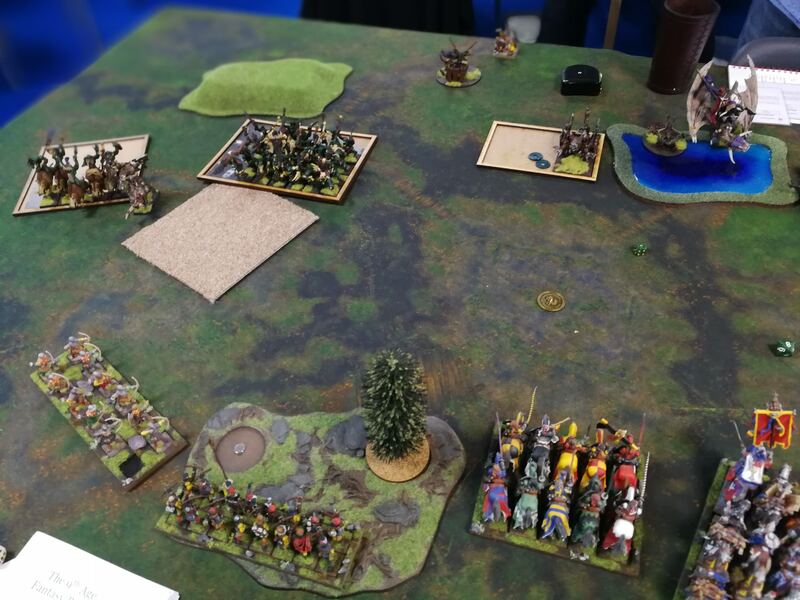 The Shaman is in the Feral Orcs and the Iron Orc BSB is in with the Iron Orcs. My opponent has no vanguards so I just move the Yeoman forward a bit. We actually end up with the same number of drops so it’s a straight roll off, which I win, meaning I get to go first! I move the army forward cautiously, I don’t want to be charged by anything if I can avoid it. I move the Yeoman as far forward on the right flank as I can to chaff up a unit of Boar Riders so that if they charge I can have a nice counter charge into them with the Pegasus Knights or the Knights of the Realm. 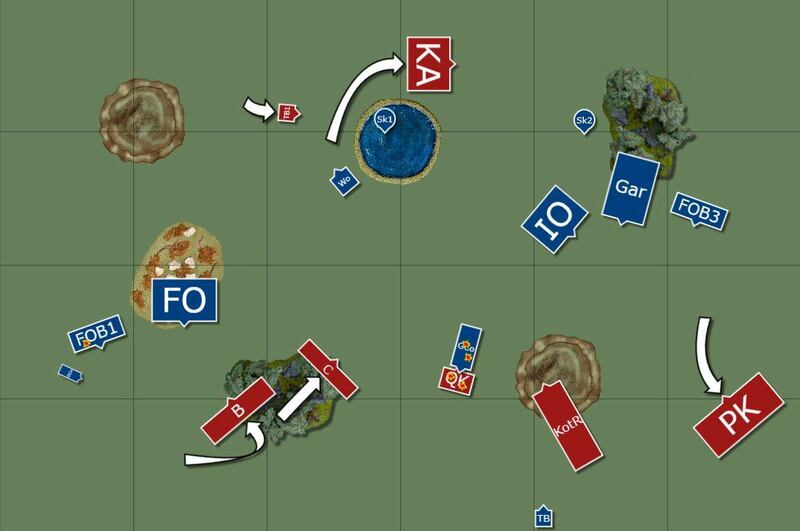 In hindsight it wasn’t a great move and a waste of my Yeoman, I should have kept them back for a turn. In the Magic Phase it’s a low round with 7 Power Dice v 5 Dispel Dice. I start things off by casting Swarm of Insects on the Skewerer in the water feature, my opponent lets this one through. The spell inflicts 2 wounds on the Skewerer, was hoping for more but I’ll take it. Next I through my last remaining 4 dice at Totemic Summon and my opponent tries to dispel it with 5 dice but he fails, the spell goes off and the drunken peasant rabble rolls on the board just behind the Git Launcher. At least I only have to take one round of shooting from that thing hopefully. In the shooting phase the Brigands shoot at the Goblin Wolf Chariots and are able to cause 2 wounds on them. 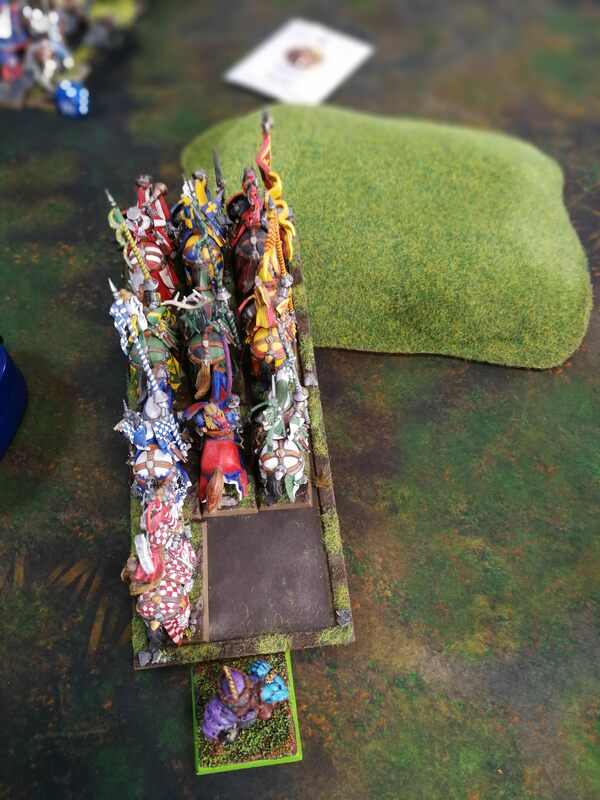 The Crossbowmen then open fire on the Chariots as well and cause 4 more wounds, killing one of the Chariots, sadly the remaining Chariot passes his panic test and stays on the field but they’re nowhere near as much of a threat as they were. The Yeomen shoot at the Skewerer on the right and actually cause a wound to it. Not a bad first turn for myself there, magic and shooting both went very well. There’s one charge from the Orcs & Goblins, the Feral Orc Boar Riders on the right charge the Yeoman, I flee but only flee a measely 6”, the Boar Riders go 10” and catch the Yeoman, how annoying. As the Yeoman were 10” away from the Boar Riders I thought I’d easily escape. The Boar Riders end up about 1” in front of my Pegasus Knights. The rest of the army moves forward but slowly as they don’t particularly want to be charged either. 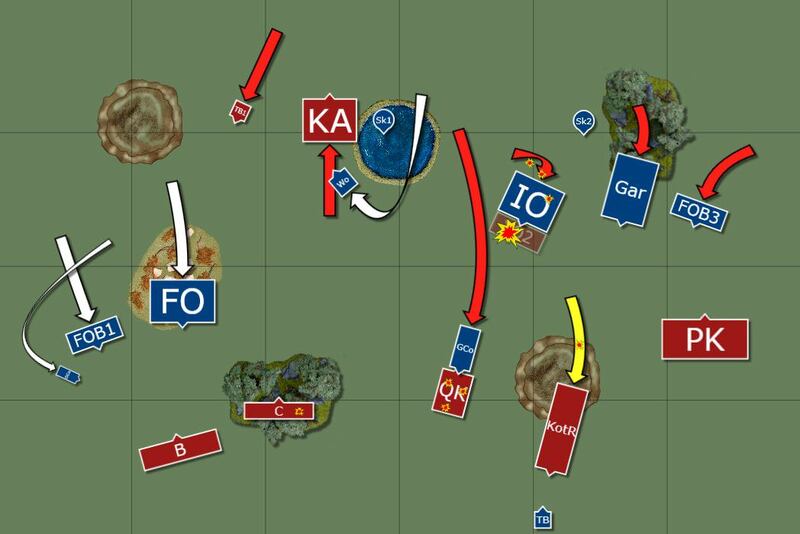 The left flank run as fast as they can as there’s only Brigands there to stop them. It’s the biggest Magic Phase for the Orcs as the 8 card is drawn, my opponent conserves 3 veil tokens so it’s 9 v 7. My Opponent starts off with Break The Spirit on the Questing Knights, he gets a good roll on 4 dice (20 or something) and I’d have to use most of my dice to dispel it so I have to let it through. Next my opponent casts Swarm of Insects on the Crossbowmen, I try to dispel it with 3 dice but fail. The Swarm of Insects does 17 hits but no 6s are rolled to wound. For the Shamans last spell this round he casts Totemic Summon but I am able to stop that one at least. Onto shooting and the Git Launcher kicks it off by shooting at the Questing Knights and scores a direct hit on them and kills 2 Questing Knights, it must have known it’s about to die so let out one good last shot. I’m hoping that’s the worst of it now, I mean the Dwarves in the last game had a Bolt Thrower and that was useless, how bad can a Gobling one be? The Skewerer in the water shoots at the Questing Knights and scores a hit as well and with its penetrating hits it gets 4 hits and is able to wound with all of them, I fail all my wards saves and 4 Questing Knights die! The other Skewerer shoots at the Questing Knights too but luckily that one misses. Now that is a painful loss for the Questing Knights, half the unit has been wiped out now and I have very low expectation for that unit of 6, even with the BSB in there. 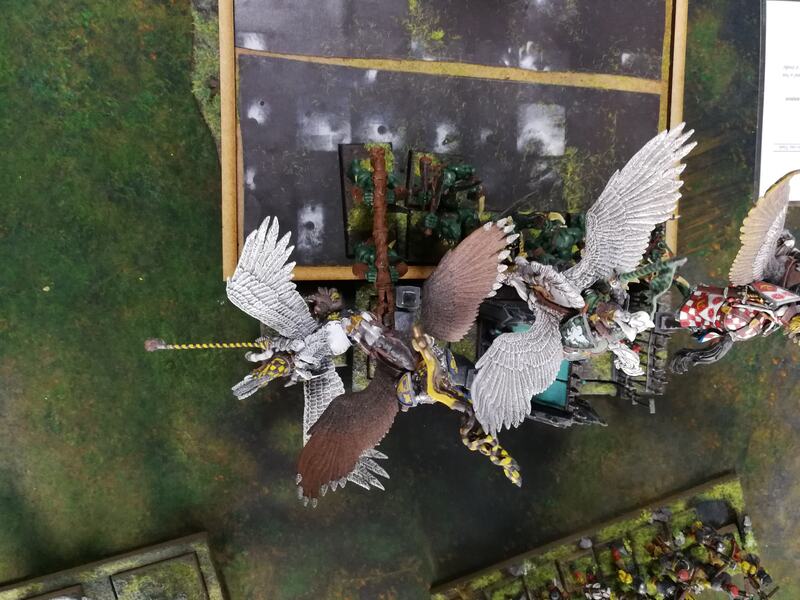 The Web launcher on the Gargantula shoots at the Knights of the Realm and scores a hit but doesn’t cause any wounds to the knights, however the unit will now have to take Dangerous Terrain tests which is unfortunate. With the absolute hammering my Questing Knights have taken in that last turn it is time to enact my cunning plan! I start off by charging the Feral Orc Boar Riders in front of the Pegasus Knights with the Knights of the Realm into their flank. The second piece of the puzzle is to charge the Pegasus Knights into the Gargantula, if they pull that off then the Knights of the Realm will be free to do a post combat pivot and face the Iron Orcs or the other unit of Feral Orc Board Riders. The Knights of the Realm can’t fail their charge and go into the flank of the Boar Riders but thanks to the Web Launcher of the Gargantula they have to take Dangerous Terrain tests and I fail one of them, killing a knight. 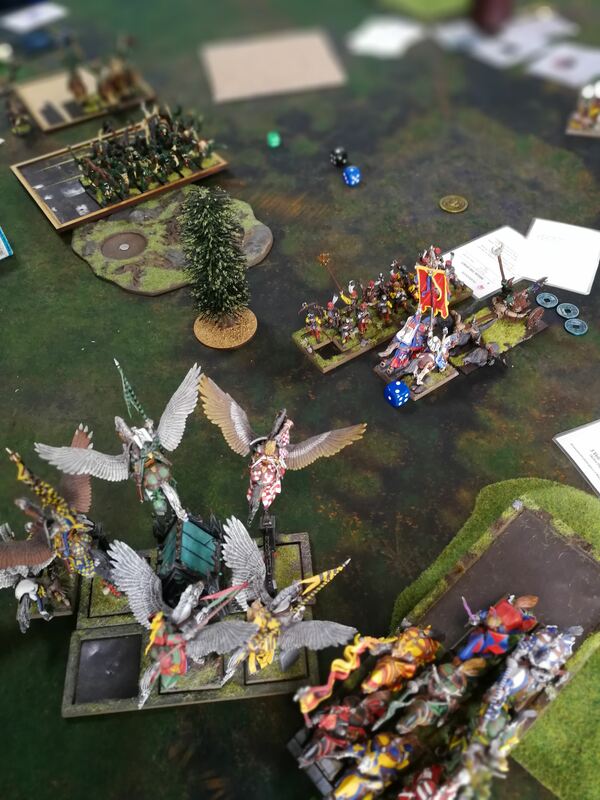 The Pegasus Knights need an 8 on the dice to charge the Gargantula, not a huge ask with 3D6 but sadly they fail it and stay where they are, now all my plans lie in tatters. There’s still more charges to be had at this point, I charge the Knights Aspirant at the Goblin Wolf Chariot which shoots at the Aspirants as its charge reaction but causes no wounds. The Aspirants need a 10 on the dice but thanks to their reroll from being impetuous they make the charge. Now they just need to win that fight and overrun to get out of the line of sight of the Warlord. The Totemic Beast charges the Git Launcher. The Brigands run 8” back away from the Orcs on the left flank. The Questing Knights have Break the Spirit cast on them so I decide to just walk backwards with them. I move the Yeomen in front of the Iron Orcs to chaff them up for a turn and stop them from charging the Knights of the Realm. Onto the Magic Phase and it’s 8 v 6 on the dice, the only spell I’m able to get off this turn is Break the Spirit on the Iron Orcs which should hopefully keep my Yeomen alive for another turn. 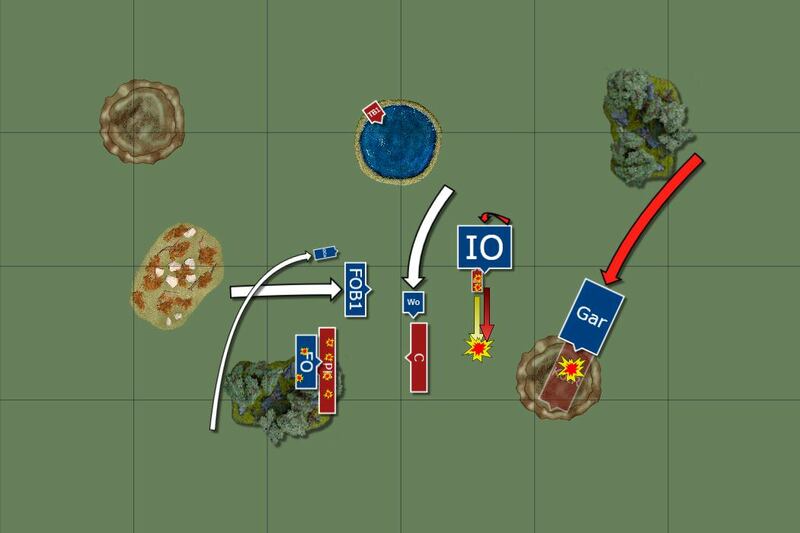 In the shooting phase the Crossbowmen shoot at the Feral Orcs and kill 3 of them. The Brigands then open fire at them and kill 2 more, not too shabby at all. In the combat phase I start with the Aspirants who easily kill the Goblin Chariot and so I overrun and they go far enough to get out of Line of Sight of the Wyvern. The Totemic Beast goes next and inflicts 4 wounds on the Git Launcher which isn’t enough to kill it sadly. The Git Launcher attacks back and does no wounds to the beast. 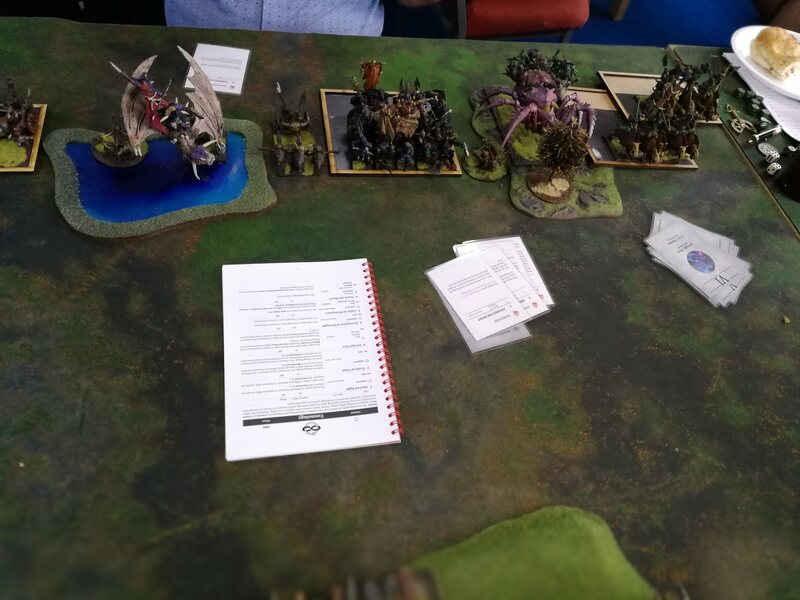 The Totemic Beast wins combat and the Skewerer runs from combat, I pursue with the Totemic Beast and with the random movement of the beast I easily catch the Skewerer crew. The Knights of the Realm go barrelling in to the flank of the Feral Orc Boar Riders and kill them all with impact hits alone. 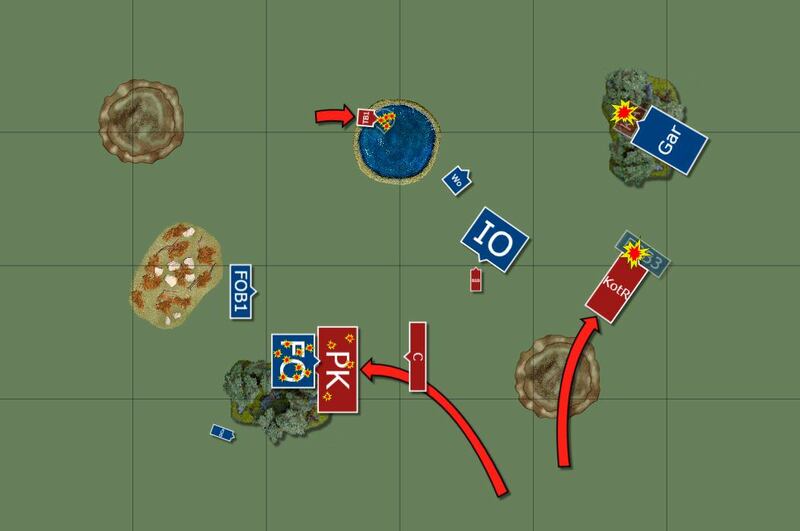 They then do a post combat pivot to face the Gargantuala as I’m sure that’s coming for me next. 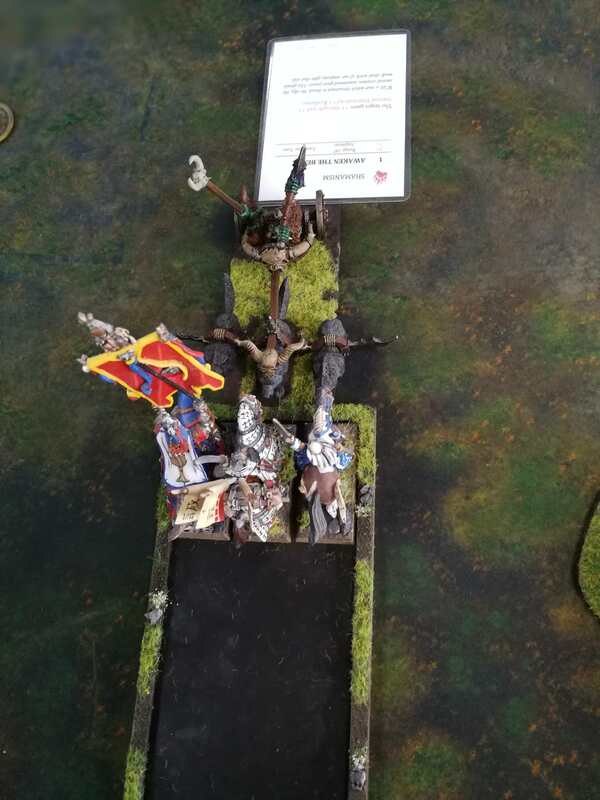 The Orcs start the turn with a few charges, the Goblin Chieftain on the chariot declares a charge into the Questing Knight, he needs an 11 so I decide to take it. The Chariot makes the charge! The Iron Orcs decide they don’t care about the Break the Spirit and charge the Yeomen, I hold that charge to halt their advancement. The Iron Orcs make the charge but lose 3 Orcs to dangerous terrain checks, I was hoping for a lot more failures than that. The Feral Orcs Boar Riders charge the knights of the Realm and I hold that charge as that’s a fight I can win. The Gargantula then declares a charge into the Knights of the Realm and I flee that one. 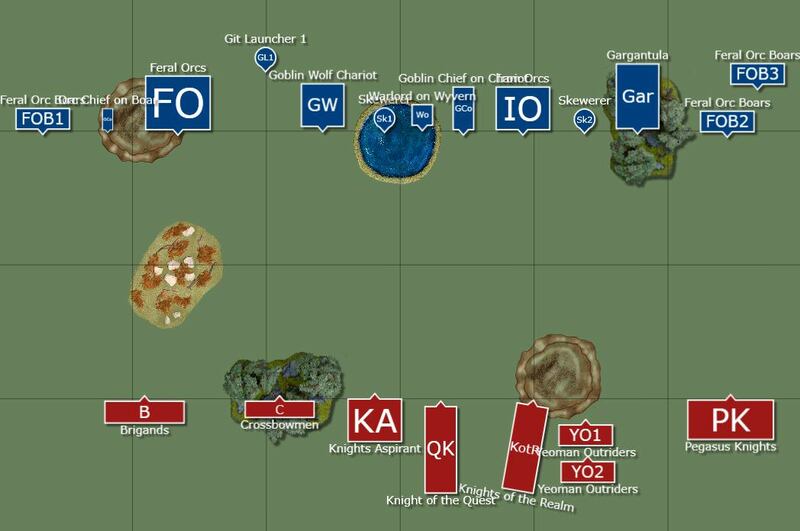 The Gargantula attempts to redirect it’s charge but fails and so it has to go for the Knights of the Realm, The Knights of the Realm flee 8” and the Gargantula fails to catch them. The Knights lose 1 more guy to dangerous terrain from the web launcher. 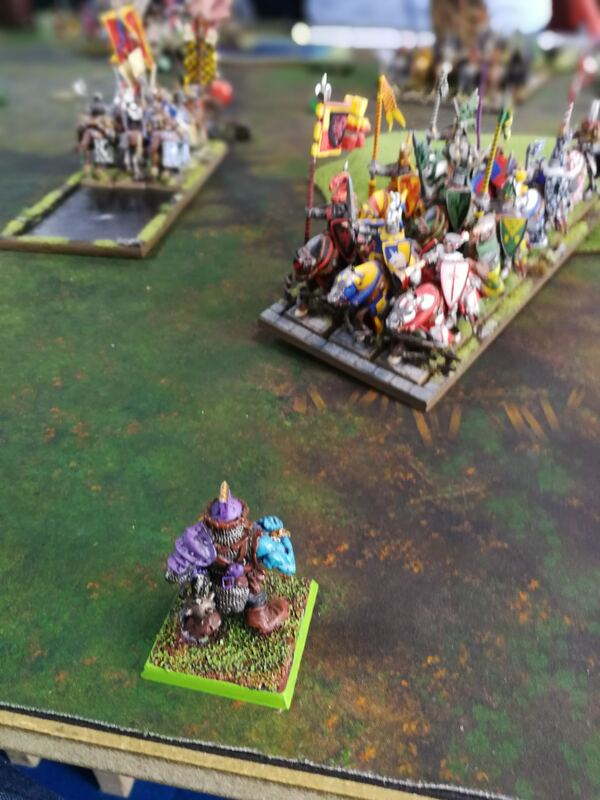 The Boar Riders also fail to redirect and charge the Knights of the Realm but they fail to reach them. The units on the left flank all advance down the flank towards the crossbowmen. 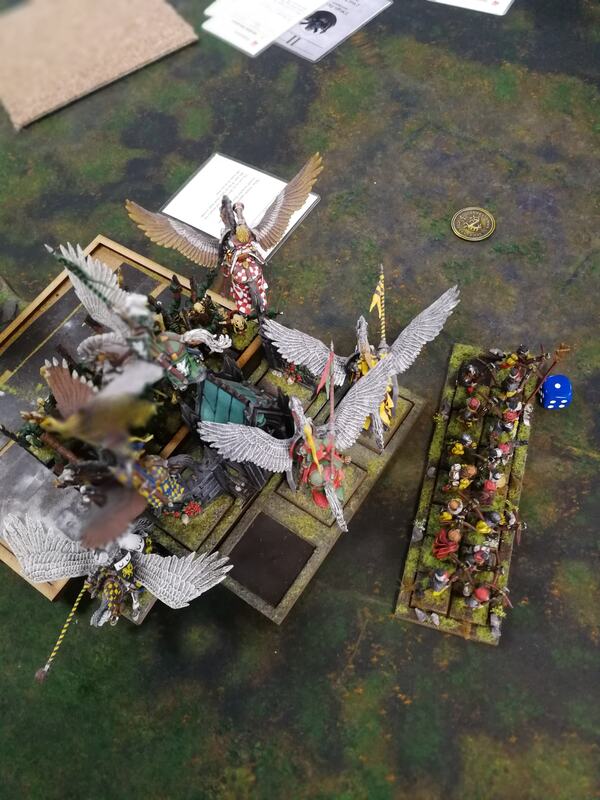 The Wyvern Warlord flies around to the rear of the Knights Aspirant to threaten their rear but they will still be able to get out of his line of sight, just. It’s a decent magic phase for my opponent with 8 v 5 dice. The shaman kicks things off with Totemic Summon which I have to let through as it’s a good roll. The Totemic Beast comes on just in front of my Knights of the Realm. I love that old school ogre model, brings back fond childhood memories. Next the Shaman casts Swarm of Insects on the Crossbows (I should state that we forgot about the -1 to hit for shooting attacks from units affected by Swarm of Insects unless they move from when the spell was cast last turn by my opponent and me and we will forget again about that). I try to dispel it but I fail. The spell gets 13 hits but only causes 1 wound luckily. For the final spell it’s just a dice off, 3v3. The Shaman casts Awaken the Beast on the Goblin Chieftain Chariot and I fail to dispel it so the Goblin Chieftain is now S6 on the charge. The Skewerers fire at the Knights of the Realm but their luck is all used up as they both miss. The Gargantula misses with the Web Launcher as it tries to shoot at the Pegasus Knights. There’s no further shooting so it’s onto combat. The Iron Orcs unsurprisingly smash the Yeomen Outriders with just Paired Weapons, the Iron Orcs then pivot to face the Pegasus Knights. 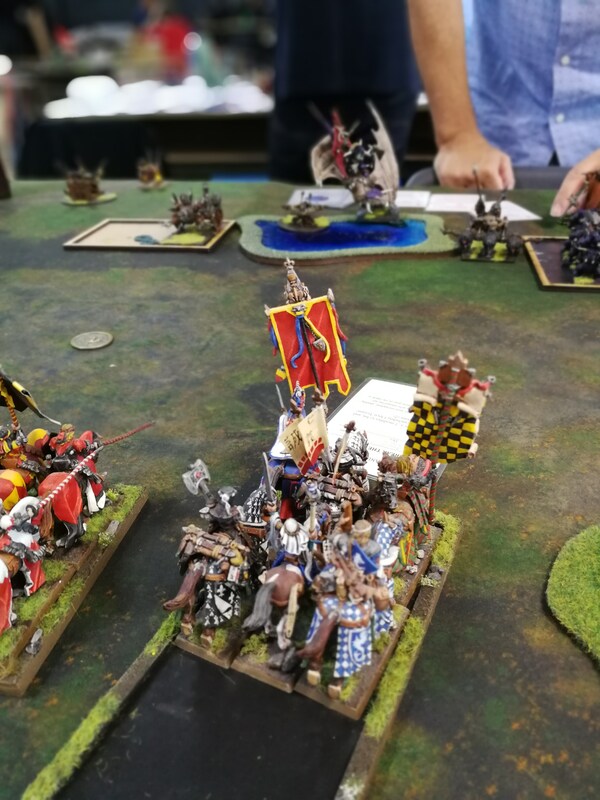 In the only other combat the Chariot kills 2 Questing Knights with impact hits and then the Goblin Chieftain gets to strike and he kills one more Questing Knight. The wolves and crew do no wounds. The BSB, unit champion and Damsel attack back but do no wounds. Fortunately the Questing Knights are Steadfast, just, and stick around for another round of fighting. Need to do better though or they are all going to die to a Goblin! No charges from me this turn as the only possible one I could do would be the Pegasus Knights into the Gargantula but that would leave me in such a bad position that it’s not worth the risk so instead I fly the Pegasus Knights back and hope my opponent leaves me an opening. The Knights Aspirants march around the water feature and get out of the arc of sight of the Warlord. The Totemic Beast moves towards the Skewerer, only needs a 10” but it only moves 4” or something equally pathetic. 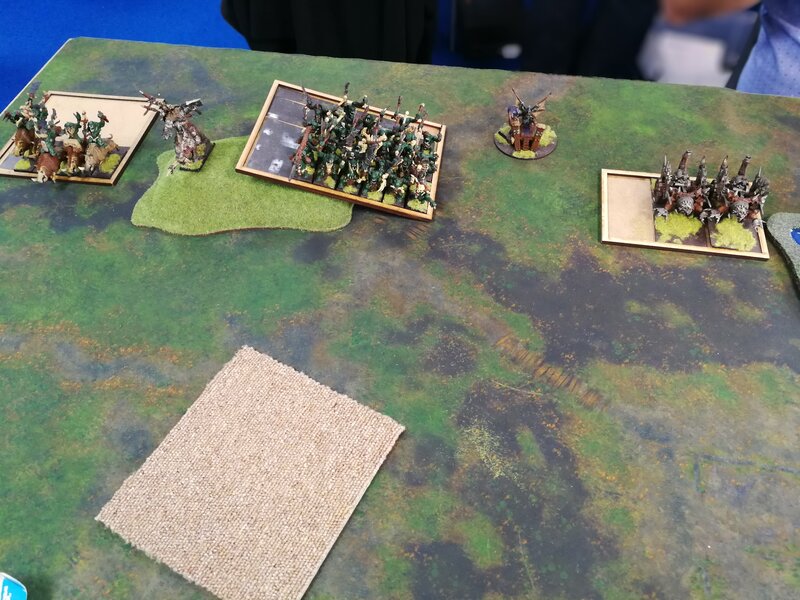 The Crossbowmen march to their left and out of the line of sight of the Feral Orcs, The Brigands march in between the Crossbowmen and the Orcs on the left to try and protect them. The Knights of the Realm rally and turn to face the Iron Orcs. 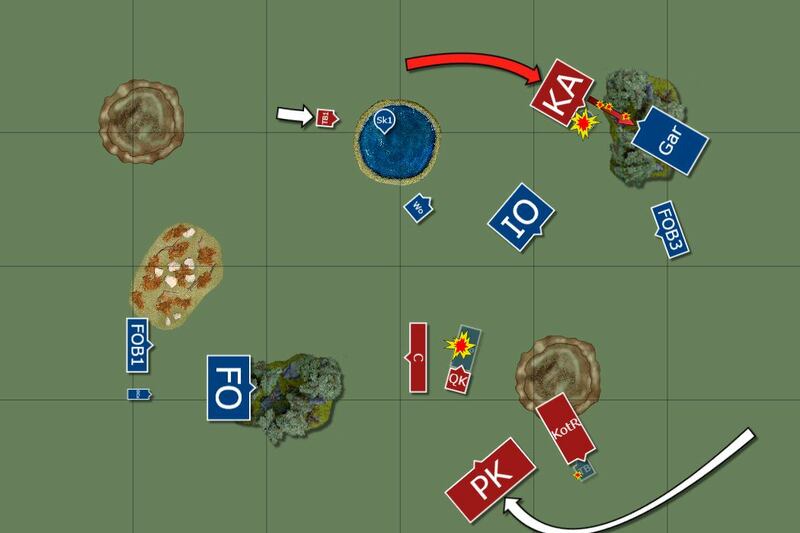 It is a small magic phase, 5 v 4 on the dice. The only spell I’m able to get off is Breath of the Lady on the Questing Knight unit. The only shooting is the Brigands shooting at the Feral Boar Riders and they score a wound ont hem, killing one of them. There’s only one combat and it’s the Questing Knights. The Goblin Chieftain goes first and attacks the Questing Knight Champion and is able to kill him. The crew and the wolves pulling the chariot attack the Damsel and score a wound. The BSB needs to pull his finger out and do some damage because this little Goblin is absolutely destroying me here! 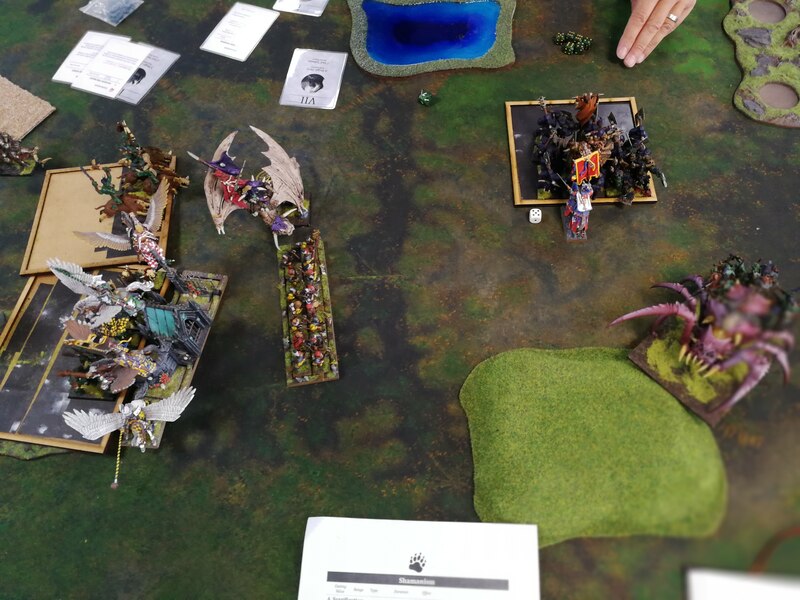 The BSB strikes back and thanks to Breath of the Lady does 2 wounds to the Chariot, the Damsel does nothing. I win combat but the Goblin Chieftain passes his break test. The Feral Orc Riders on the left charge the Crossbowmen as they can just squeeze through the gap I left because I killed one of them making it much easier for them, what an idiot! I have to flee from that charge with the Crossbows to try and keep them alive. The Feral Orcs then Declare a charge against the Brigands and I shoot as my charge reaction, killing one more Feral Orc. The Orc Chieftain then charges the Brigands and I flee that one but I only go 3”, the Feral Orcs easily catch the Brigands and destroy them and it is a failed charge from the chieftain. 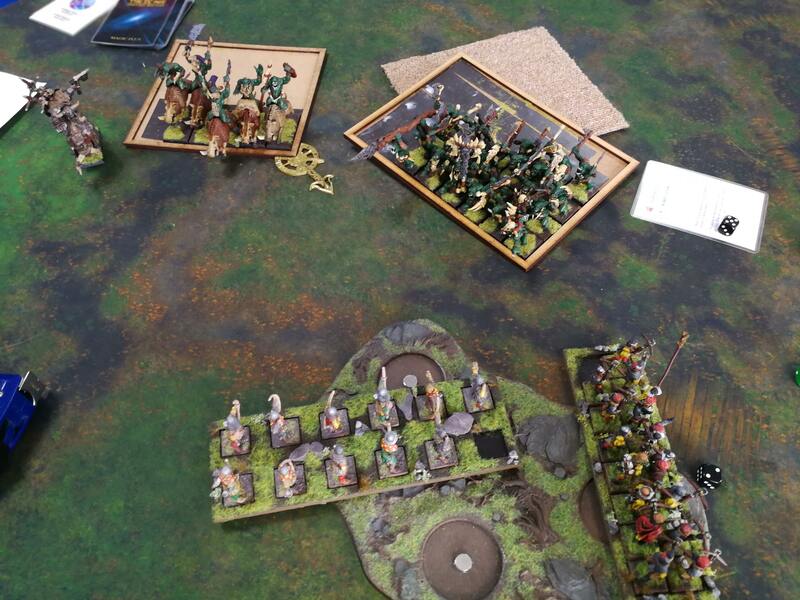 The Feral Orc Riders fail to reach the Crossbowmen so only shuffle forward a bit. The Totemic Beast of my opponent charges the rear of my Knight of the Realm, I’m not too worried as I think I still win on static combat res but it will hold me up for a while. The Gargantula turns around to face the Knights Aspirant as does the Wyvern and now the Aspirants are pretty hemmed in. 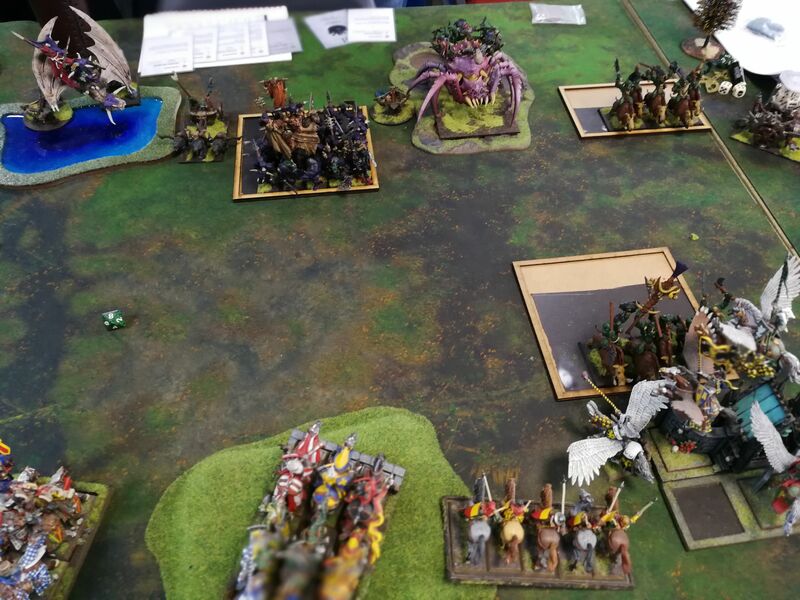 The Iron Orcs turn to face the Pegasus Knights and the remaining Boar Riders head towards the centre. In the Magic Phase it’s 8 v 6 and the Shaman starts things off with Break the Spirit on the BSB and Damsel and I have to let it through because it is a high casting roll. Next the Shaman casts Awaken the Beast on the Goblin Chieftain to boost his Strength and I try to dispel it but fail and that could be problematic. Finally the Iron Orc Chief uses his Wizarding hat to cast Bring the Pain but I dispel it. 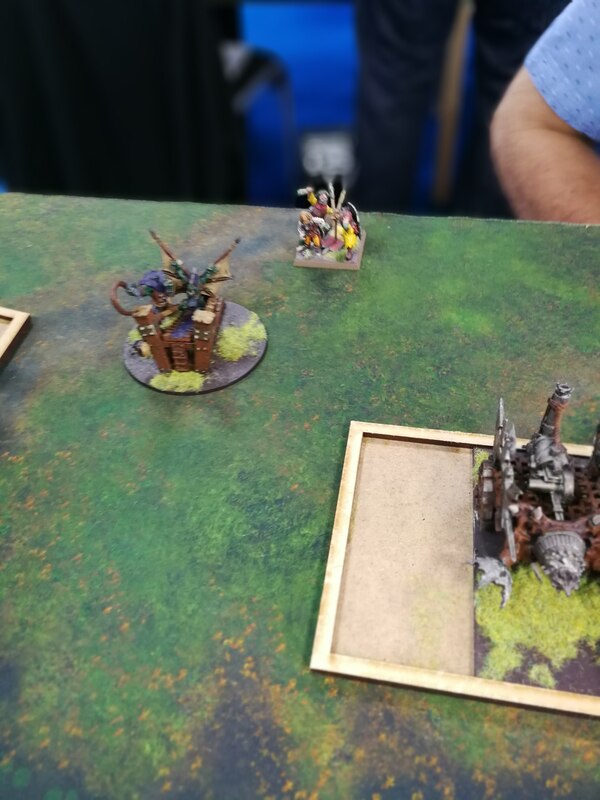 The Gargantula shoots the web launcher at the Knights Aspirant and scores a hit, one Knight Aspirant dies meaning more dangerous terrain checks for the unit. The Skewerer in the water shoots at the Totemic Beast but misses. In the combat with the BSB, the Goblin Chieftain finally has a bad round and fails to hit the Damsel. The crew and mounts don’t have much more luck. The BSB strikes back and causes one more wound on the Chariot. The Goblin Chieftain loses combat but sticks, he is at least down to one wound now. 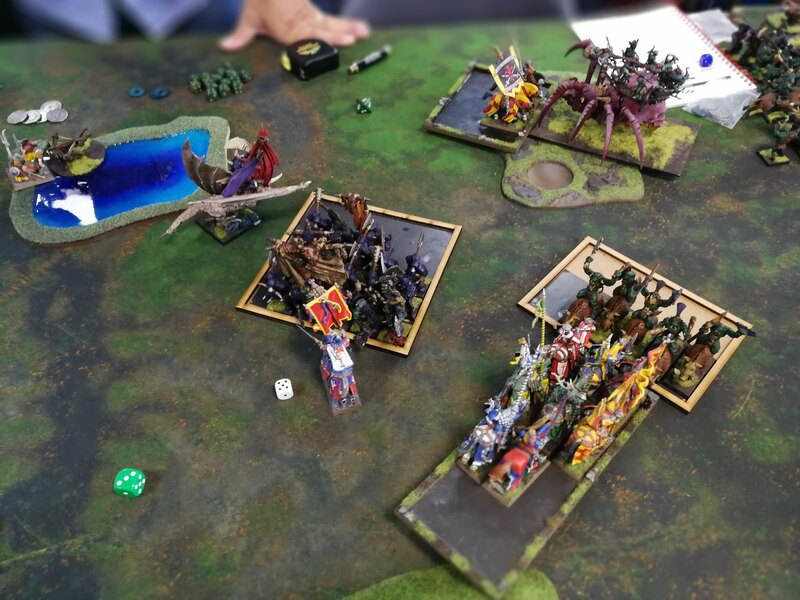 The Knights of the Realm are attacked by the Totemic Beast which is able to kill 2 Knights of the Realm, that’s a good result for a Totemic Beast, I’ve killed less skinks than that in a round of combat with one of those. 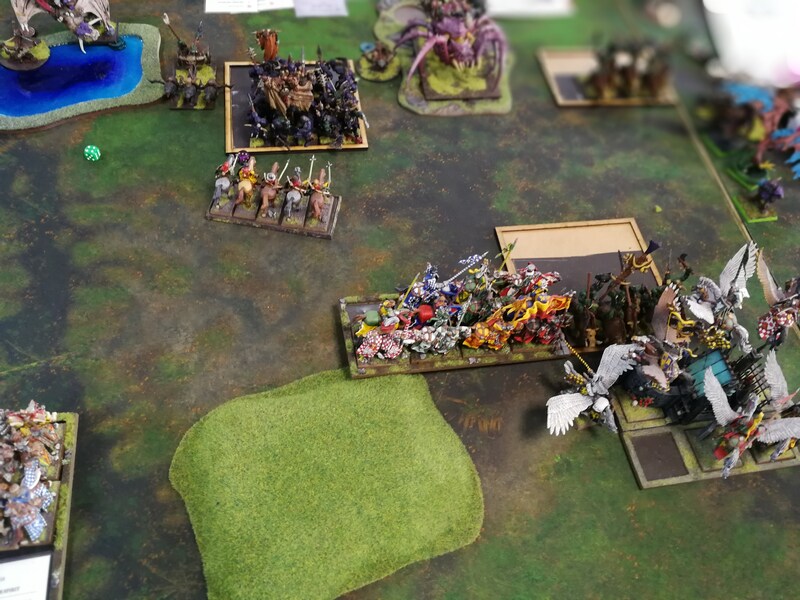 The Knights of the Realm strike back and cause 2 wounds on the Totemic Beast. I lose combat by 1 but pass my break test. The Knights of the Realm reform to face the Totemic Beast. There’s only one charge from me this turn as the I charge the Knights Aspirants into a Skewerer with the plan to overrun into the Gargantula. I have to take Dangerous Terrain checks from the Web Launcher but pass them all. It is probably suicide but the alternative is letting them get charged. I decide not to charge the Pegasus Knights into the Boar Riders with the intention of overrunning into the Gargantula as that would leave them in a bad position for next turn, the Iron Orcs would have a very nice flank charge into the Pegasus Knights and probably massacre them. Instead I fly the Pegasus knight over to the left to face off against the Feral Orcs, they have been weakened at least. I try to charge the Totemic Beast at the Skewerer but I have another shocking roll and it shuffles forward at a snail’s pace. The Crossbowmen rally and now they are in a scoring position, they just have to survive until the end of the turn and I get my first secondary objective point. For the Magic Phase it’s 9 v 6 and I am able to cast two spells, I get Breath of the Lady off on the BSB, hope it’s enough to keep the Damsel alive for this turn. In also cast Break the Spirit on the Feral Orcs. There’s no shooting so it is straight to combat. The Knights Aspirant easily kill the Skewerer and then overrun into the Gargantula, on the way though they have to take more dangerous terrain checks and I fail three of them, killing 3 Aspirants, not what I needed when I’m about to face a Gargantula. 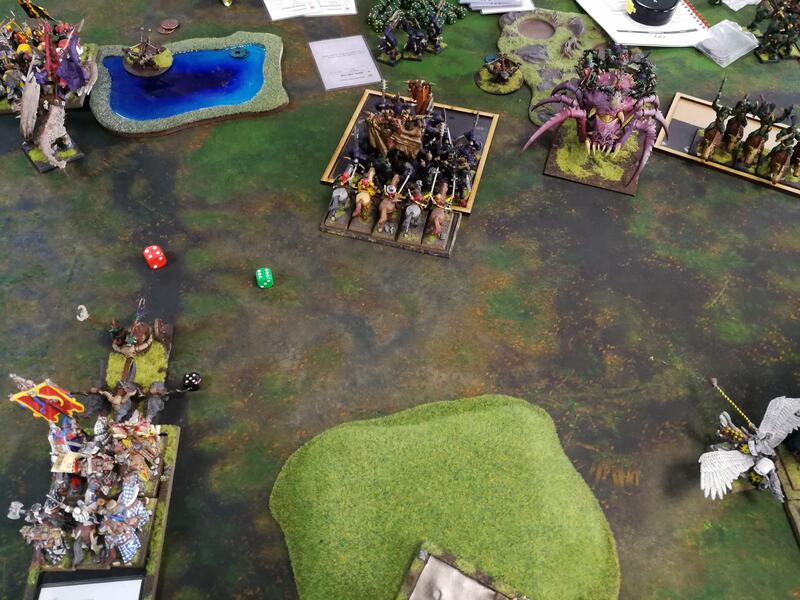 The Knights of the Realm finish off the Totemic Beast and then pivot to face the Iron Orcs. The Knights Aspirant kill the Skewerer on the charge and then overrun into the Gargantula. The Goblin Chieftain attacks the Damsel but fails to cause any wounds on her, she’s been very lucky so far. The BSB strikes back and he finally kills the Goblin Chieftain. That Chariot has been nothing but a pain so far, so good riddance! Three charges from the Orcs this turn. The Feral Orcs charge the Crossbowmen I shoot as my charge reaction and kill 3 more of the Feral Orcs, that unit is almost at half strength now. 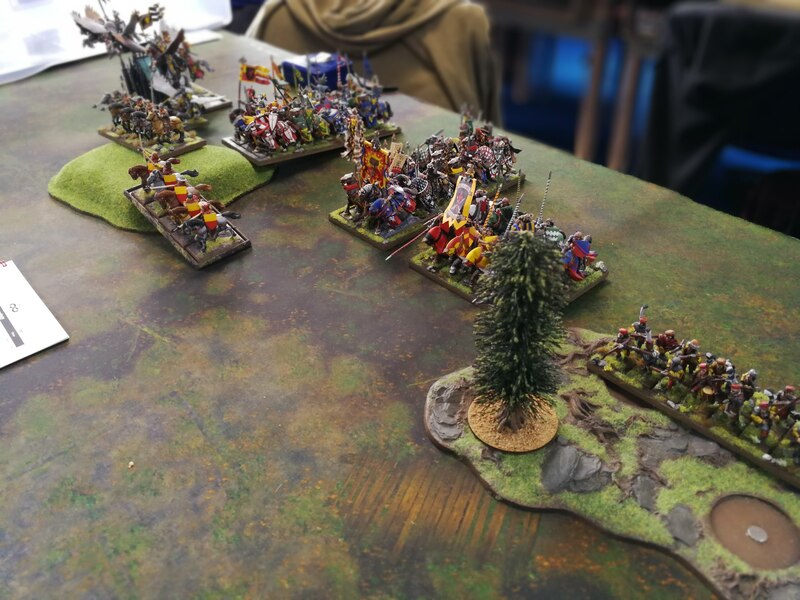 The Wyvern Warlord declares a charge into the flank of the Knights Aspirants and the Feral Boar Riders declares a charge into the Knights of the Realm. All three units fail their charges and I’m feeling incredibly lucky because of that, the Wyvern Warlord only need a 7 or higher. Miraculously the Feral Orcs pass all their Dangerous Terrain Checks from Break the Spirit, that’s quite annoying. 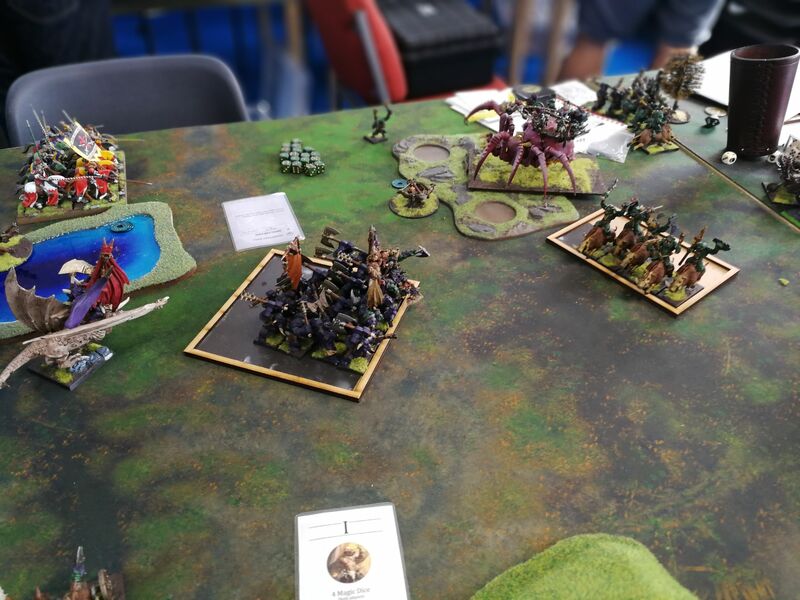 The Boar Riders and the Orc Chief move towards the centre of the board and the Iron Orcs turn to face the Crossbows. 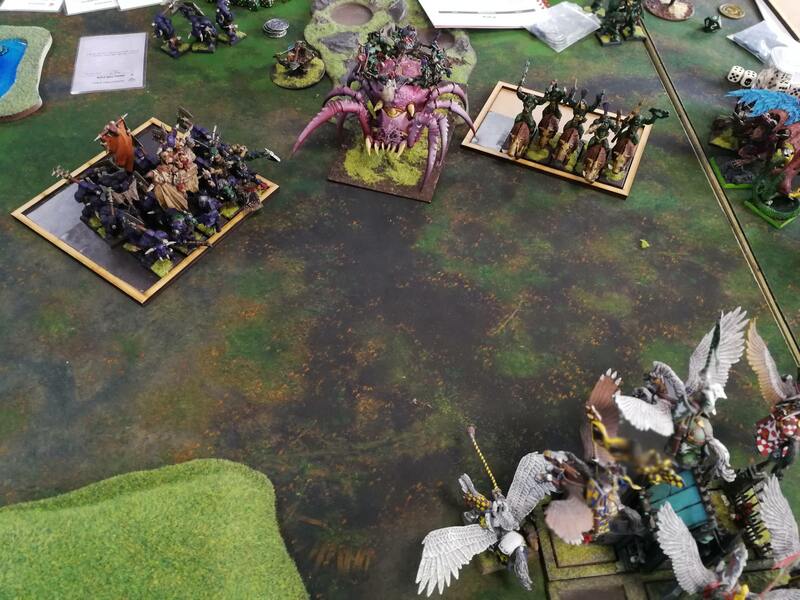 In the magic phase it is 6 v 5 dice and my opponent only gets one spell off, Swarm of Insects on the BSB and Damsel, The BSB easily tanks his hits but the Damsel is not so fortunate and takes 2 wounds from the spell, she fails her armour saves and Aegis Saves and succumbs to her wounds leaving me without magic now. Just the one combat this turn as the Aspirants slam into the Gargantula and fail spectacularly as they are unable to cause a single wound. Ten Gargantula strikes back and kills 3 Aspirants. The Aspirants lose combat by 1 but stick around for another fight but they are doomed now really. The Crossbowmen are still safe and sound and are the only unit within 6” of the centre so I get the first scoring point for holding the centre. We are running out of time now mostly because we’ve just been chatting too much and discussing each other’s armies for too long, so this will be our final turn. 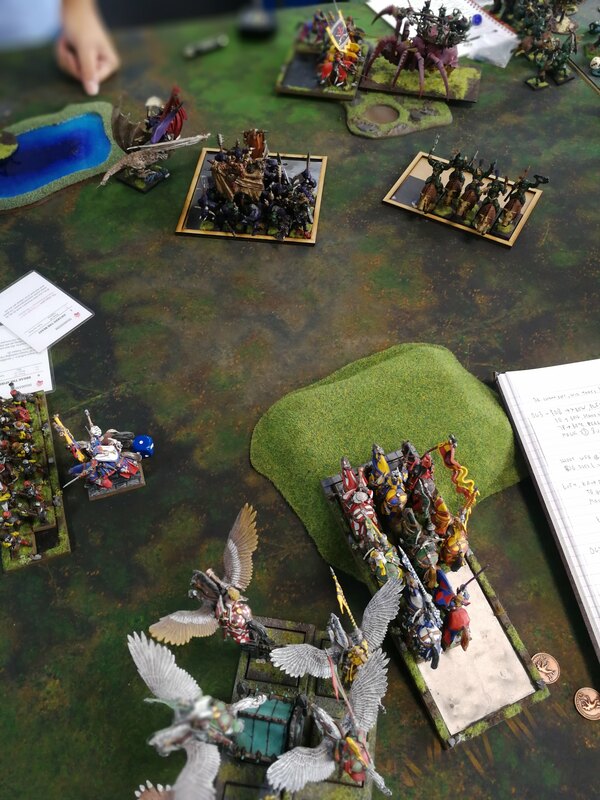 I charge the Pegasus knights at the Feral Orcs, with just 16 left in the unit I’m fairly sure I should be able to break them in this turn or the next, it also protects the Crossbowmen. 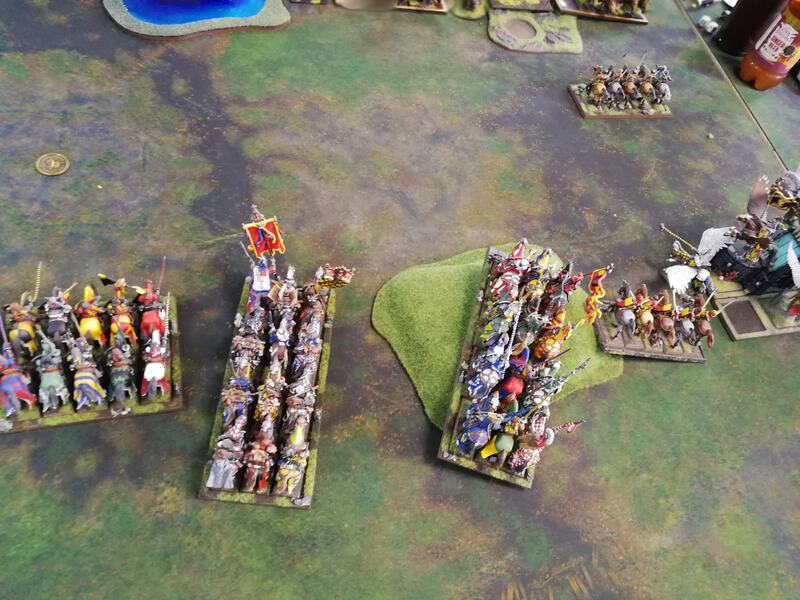 I charge the Knights of the Realm at the Boar Riders on the right. The Totemic Beast finally makes it into the Skewerer in the water on the third attempt. The only other move I do is move my BSB in front of the Iron Orcs to try and chaff them up, he’s very expensive chaff but I’m fairly certain that they won’t be able to kill him but we’ll see. There’s no Magic and the Crossbows can’t see anything to shoot at so it goes straight to combat. The Knight of the Realm easily kill all the Feral Orc Boar Riders before the Orcs can attack back, I don’t overrun, instead I do a post combat pivot to face the Gargantula because if he kills all the Knights Aspirants this turn then it will turn to face the Realm Knights and I’m going to have to flee that one, giving away half points for the unit but at least not the whole unit. We do the Gargantula combat next and as expected the Gargantula kills the last of the Knights Aspirant and then turns to face the Knights of the Realm. The Totemic Beast does 4 wounds to the Skewerer, killing it because it had taken 2 wounds from a Swarm of Insects in Turn 1. Onto the big fight and the Pegasus Duke gets to attack first and rather than attack the Shaman I decide to put all my attacks into the unit, the Duke kills 3 Feral Orcs. The Pegasus Knights attack next and kill 2 more Feral Orcs and then the Pegasus’ themselves attack and kill 3 more Feral Orcs. The Feral Orcs get to strike back and cause 4 wounds, slaying 2 Pegasus Knights. I get 4 stomp attacks and only kill one more Feral Orc. I win combat but the Feral Orcs are Steadfast too but just 3 guys. If I had some magic to cast this turn I think that would have given the Pegasus Knights the edge to break that unit, hopefully I can break them in the next round. A couple of charges from the Orcs in what is the last turn of the game, the Iron Orcs charge the BSB and I hold that one as they are over 6” away from the centre at this point. 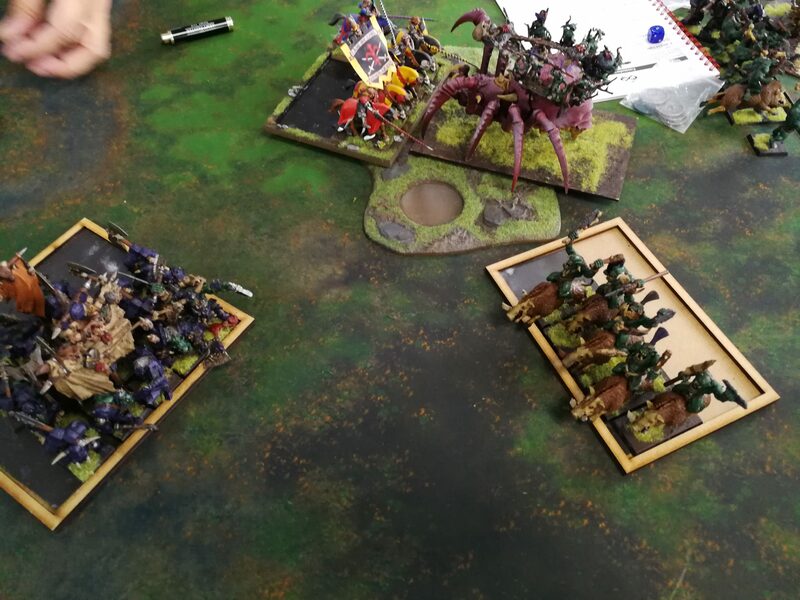 The second charge is the Gargantula charging the Knights of the Realm, I flee this charge but I only go 6”, I should still be ok though as this leaves the spider needing 12 on the dice to catch me… which he obviously rolls and runs down the whole unit. 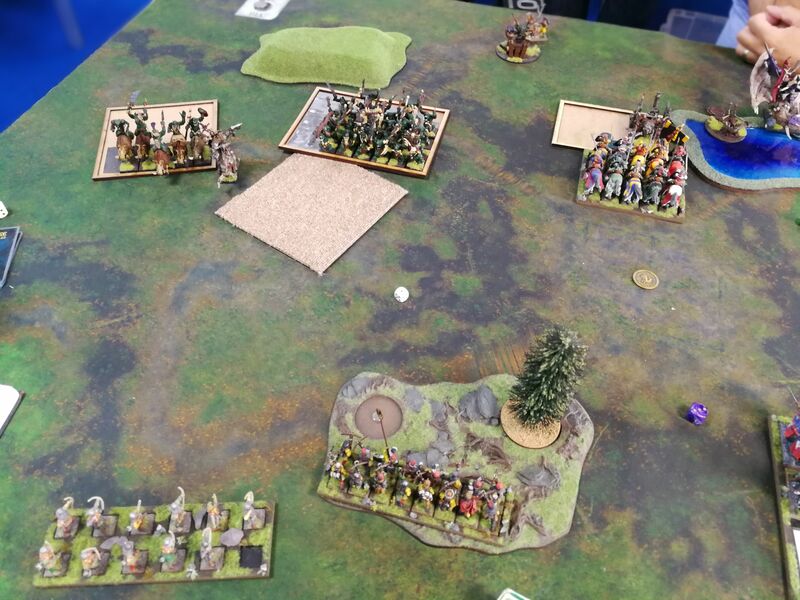 The Feral Orc Boar Riders run into the centre to contest the objective alongside the Crossbowmen but it’s looking too late now for the Orcs to draw the secondary objective so I at least have that. In the magic phase it’s the 7 card and it’s 9 v 6. The only spell my opponent is able to get off is Awaken the Beast on the Feral Orcs boosting their resilience to 5, making the job for the Pegasus Knights much harder. In combat we start with the BSB and we all decide to use Great Weapons for this round and unfortunately my BSB fails to kill any of the Iron Orcs, I had better expectations than that. The Iron Orcs strike back and are able to cause 2 wounds on the BSB as they are now Strength 7, so absolutely ruining his armour. The BSB is auto breaking from that combat after that absolute shambles, I guess I was silly to think that fight could have possibly have been a draw. The BSB flees 7” but the Iron Orcs easily catches him, killing my BSB. In the last fight of the game the Duke strikes first against the Feral orcs but is only able to kill 1 Orc. The Pegasus Knights fail to kill any and the Pegasus’ can only kill one more as well, a very poor performance from the Pegasus Knights I think, I know the Feral Orcs are resilience 5 but I still thought we could get more than 2 kills. The Feral Orcs strike back and there’s only 5 of them and a Shaman at this point but despite that they are still able to put 4 wounds on the Pegasus Knights, killing two more of them! I lose combat after that but luckily I pass my break test and stick. The game ends there and what a poor final turn it was from the Kingdom. 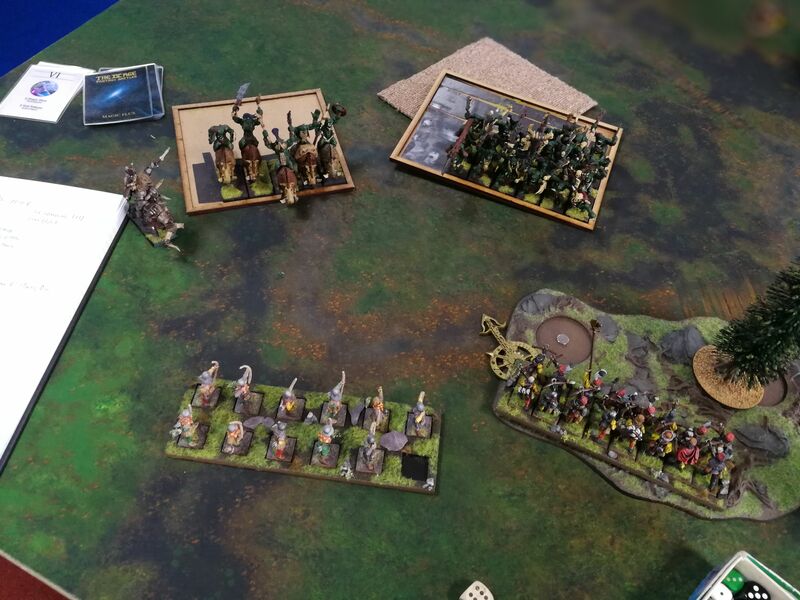 After totalling up the Victory points scored it’s a big win to the Orcs & Goblins 15 – 5 but I did get the secondary objective so it’s a 12 – 8 in the end. 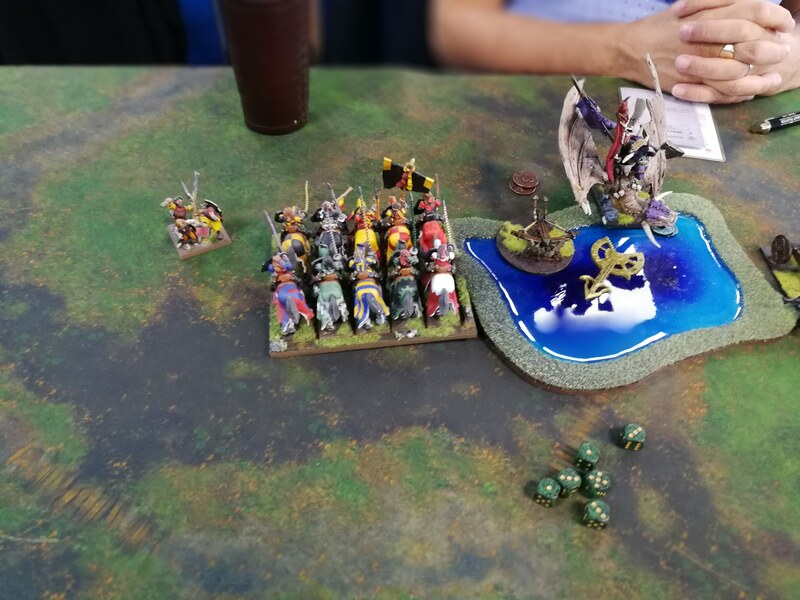 That was a pretty disastrous game for me but there were two key points where it all went a bit wrong, the first one was the first round of shooting against the Questing Knights, killing half the unit made them so ineffectual. The Second major failing was the Pegasus Knights failing their 16” charge into the Gargantula, if I made that charge I think it would have been a very different game as I like to think my Duke would have finally been able to kill something, with rerolls to hit and rerolls to wound, doing D3=1 multiple wounds even he couldn’t fail to kill that beast! With both of those things going wrong it left me unable to deal with the Gargantula so I just had to distract it with Knights Aspirants in the end. I’m disappointed that the Pegasus Knights couldn’t do more damage against the Feral Orcs and to take so much of beating from Feral Orcs is just embarrassing, these guys are the have Resilience 4 and a 2+ Armour Save, they should be able to take some hits from Strength 4 orcs easily enough. That Goblin Chieftain on the chariot gave me no end of trouble as well! I thought for sure that the Questing Knights would make short work of his chariot but I just couldn’t do anything to him at all. It was the Awaken the Beast my opponent cast on him when he charged that really tipped the balance in his favour. I should have thought more about that magic phase and tried to stop that spell. All in all though it was a very enjoyable game but definitely a game I felt that I could have won if I played better. So that’s the end of the tournament, in the end I finished 40th out of 44, so not bottom at least! I did win Best painted though and to be honest that’s all I was hoping for. After this tournament I definitely need to have another look at the Kingdom of Equitaine to find a list that works for me, some of the units I took certainly didn’t pull their weight (I’m looking at you Pegasus Knights) and some choices were solid but just had the misfortune of being pushed about by a terrible general. One thing that I will definitely keep is Shamanism, that is a fantastic lore and if it wasn’t for Totemic Summon I may have faired even worse in my games, them Totemic Beasts netted me a lot of points! I am tempted to take 2 Damsels next time though just for the extra channel and a bit of spell variety. The Crossbows were very meh if I’m honest, they are certainly better than just bows but the cost of them is exorbitantly high for what they are, it would be a rare occasion that they ever got their points back. The Brigands weren’t much better, they did do some killing but they were more just poor chaff, I’d rather take another unit of Yeomen Outriders. The Yeomen are very good for what I needed them to do, I just need to use them better, I either use them at the wrong time or I just have them in bad positions, I often move them as an afterthought and that’s not what they are there for. 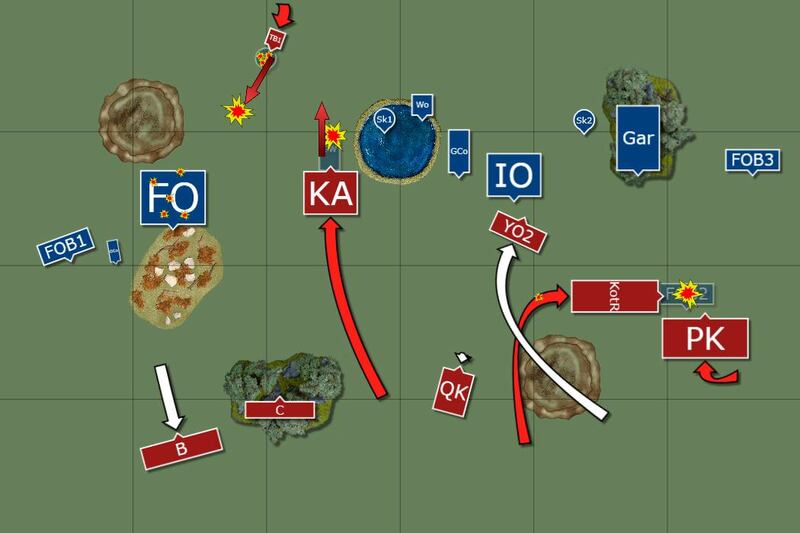 I was happy with the Aspirants who I thought did a sterling job in this tournament and I definitely prefer running them 5 wide because getting their extra attacks on the charge is good and not having such massively long flanks is good to, means they can actually get out of the Arc of Sights of enemies. The Knights of the Realm were very good and the Banner of the Last Charge is also a very good choice, just upsets me that it is basically an auto include in any Kingdom list now. 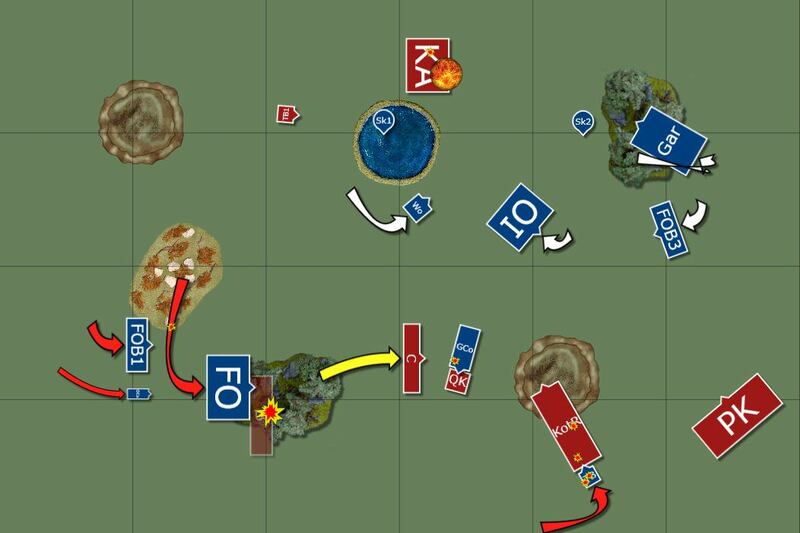 Speaking of magic banners, The Oriflamme, what a bloody waste of points that was, mostly because I forgot about it but even when I did everyone passed their Fear tests and they didn’t have BSBs to be concerned about the lack of rerolls, won’t be taking it again, I’d rather have more bodies on the field. The Questing Knights are a good unit and at roughly the same points as Knights of the Realm they are definitely worth taking, just a shame I only have one unit painted, give me a year and I might get a second painted. The Pegasus Knights were my biggest let down on the whole, they are so expensive for what they are and they just disappointed me every time. I know it’s because I wasn’t really using them correctly, they should be a support unit really, they aren’t there to go toe to toe with units because they will never break them but I thought I threw them into some pretty easy fights and they let me down. The Duke is also to blame for their failure. His load out was awful and that’s my fault. Grail Oath is overpriced for what it does, it should give divine attacks dammit! The Divine Judgement is overcosted for what it does as well, the multiple wounds is good but only being able to do it on the charge makes so situational and utterly useless for like 75% of turns really. I mean he might be able to get two or three charges off in a game but he’s only using it on those turns after that he’s just carrying a very expensive stick really. Wouldn’t use it again. Virtue of Audacity is a bit naff too but again it’s because I never got into any of the decent fights were it would have mattered. That pretty much sums up my feelings after a great weekend of war gaming. I’m hoping to do a tournie in December and I’ll write that up. I’ve also got a big 10,000 point game planned so I’ll definitely be writing that one up as big games are the best! Love the reports as always, beautiful army!